Are you interested in using a chain-link fence to mark the boundaries of your commercial or industrial property? Clôtures Saint-Martin has the solution for all your chain-link fence needs. Whether you would like to install a chain-link fence around a sports field (soccer, basketball, etc. ), a school yard, a church, a parking lot or any other commercial, residential, institutional, or industrial space, our company has the manpower and expertise to manage your chain-link fencing project from start to finish. For increased privacy, our experts can also install PVC laths in the fence. 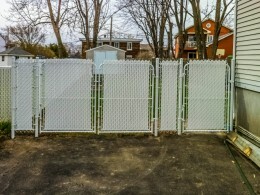 Our professionals offer sales, installation, and repair services for chain-link fences. They take the time to recommend the design that best meets your needs and your preferences. We carefully select the designs from the best manufacturers and customize chain-link fences for your technical specifications (height, mesh size, colour, etc.) to help you make your project succeed. Our experts have 35 years of experience in the field and are known for their attention to detail and quality workmanship. All of our chain-link fence installation work is covered by warranty to ensure your full satisfaction. 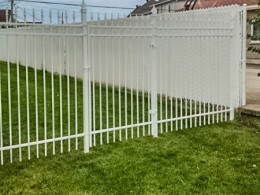 Why should I choose a chain-link fence? Chain links are popular among businesses, industries, and institutions, and that is for a number of good reasons. 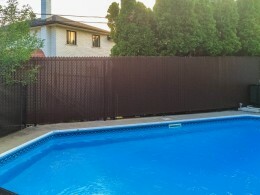 They are not only ergonomic fencing, but also fencing that is durable and weather resistant. A chain-link fence secures a commercial, industrial, or institutional space efficiently and for the long term. Please don’t hesitate to contact us for more information about our chain-link fence sales, installation, and repair services. We serve Laval, la Rive-Nord, Saint-Eustache, Deux-Montagnes, and many other areas.